A man holds posters of B.R. 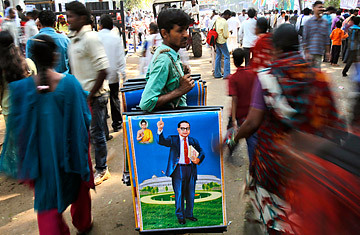 Ambedkar for sale on his death anniversary in Mumbai, India, Tuesday, Dec. 6, 2011. Ambedkar was an untouchable, or dalit, who fought British colonial rule and injustice in Indian society. Ambedkar, the chief architect of the Indian Constitution that outlawed discrimination based on caste. This post is in partnership with Worldcrunch, a new global-news site that translates stories of note in foreign languages into English. The article below was originally published in Les Echos. MUMBAI  When the Hindu temple in his hometown began falling apart, Ashok Khade agreed to pay for its reconstruction. He certainly had the means. Khade is CEO and co-owner  along with his brothers  of Das Offshore Engineering, a company that builds equipment for offshore rigs and boasts 20 million euros in annual sales. Still, the decision was quite remarkable  for one simple reason: as a child, Khade hadn't been allowed inside the temple. Why? Because he's a Dalit, a member of India's "untouchable" caste. From those humblest of beginnings, Khade grew up to become the village's savior and benefactor. "I feel really successful!" he admits with a smile. Khade belongs to a very small group of successful Dalit businessmen. But the number of companies founded and led by the men  and few women  of that community is growing, and these new CEOs want it to be known. With the help of the Dalit Indian Chamber of Commerce and Industry (DICCI), these untouchable entrepreneurs are organizing a big business fair in Mumbai, India's financial capital. "We are going to show off our knowhow to Indian companies and to Indian society as a whole," says DICCI President Milind Kamble. That Dalits can become millionaires by starting their own businesses is an astonishing phenomenon for Indian society. Heavily discriminated against, Dalits were until recently restricted to the least qualified jobs, like farming  without owning the land of course. The only other option was to work in the public sector, which starting in the second half of the 20th century, began allotting a certain number of slots to the so-called Scheduled Castes, or SCs. Now, however, as India's economy is being redrawn along free market lines, both types of jobs are disappearing, according to Surinder Jodhka, a caste expert at the Nehru University in Dehli. With no other options available, some untouchables are trying to start businesses of their own. "For young Dalits the solution is often to raise 20,000 rupees (300 euros) and open a shop or a medical office," says Jodhka. The gradual modernization of the Indian economy has also increased the prestige of starting a business. Milind Kamble is a perfect example. "I'm the son of a small town teacher, in a family with no business tradition. My only advantage was that my family was educated," says Kamble. "When I got my engineering degree, my father really wanted me to get a job in the administration, but I said no. He was furious." After several years as an employee, Kamble created his own civil engineering company. Today, Future Constructions brings in about 10 million euros per year and Kamble, who always supported the Dalit cause, became a champion of Dalit entrepreneurship. For him, their weapon is "capitalism against castism." Kamble believes the traditional caste system cannot survive in a modern economic environment. "We were inspired by the American 'affirmative action' policies," he says. "They had black businessmen before having Obama as president!" Dr. Nanda K.K. describes himself as a pure product of India's own version of affirmative action. "When I was young, even when we had nothing to eat we would study," he recalls. "In the Andhra Pradesh, were I live, there was a system to push Dalits to study, and that's what helped me become a doctor. I had a reserved spot at the university, housing and a scholarship." After working for 15 years as a small town doctor, Nanda  with the help of subsidies  opened a hospital in Hyderabad, the State capital. Today he manages a hospital with 150 beds and 15 specialized doctors and works on anti-AIDS programs with "Bill Gates Foundation grants." But he dismisses the idea that all this help actually made things too easy. "These programs allow us to have financial stability, that's all. We have to be good doctors in order to succeed," he says. Still, starting a business remains very difficult for Dalits. "Business is done through networks, especially caste networks," says Surinder Jodhka. "Since Dalits are newcomers, they don't have these kinds of networks. That makes it much more difficult for them to get a loan from a supplier. Most often, they don't have any assets to put up as a guaranty for a bank loan. In other communities, you usually have land or property. There is still prejudice against them. People tend not to trust them." For Shandra Bhan Prasad, a Dalit intellectual, it is a "historic" decision that will help the community's businessmen "enter the system." Indeed there is a lot of money at stake for these companies: 4% of public purchases represent more than a billion euros. "At the beginning there won't be enough Dalit businesses to supply demand," says Digvijay Singhm, one of the leaders of the Congress party and former prime minister of Madhya Pradesh. "But newcomers will emerge to take advantage of the situation." Another often talked about measure involves requiring the private sector to hire quotas of outcasts. The idea, which was part of Indian National Congress President Sonia Gandhi's platform for the 2009 elections, has not been well received by the industry. "We really hope this will never happen. It would be completely inefficient," says Chandrajit Banerjee, the leader of the CII employers' union. The idea has been floating around for years but major companies are working hard to prove that they are already pushing for Dalit integration and there is no need for government intervention. "The Tata group is a strong supporter of "affirmative action," says CII President B. Muthuraman, who also serves as vice-president for Tata Steel. Muthuraman claims that 19% of Tata Steel employees are SCs or STs, a figure that corresponds roughly to their share of the population. None of the company's Dalits, however, have high ranking positions. "Not yet," he says. "The road is still long." Ashok Khade's rags to riches story, in other words, remains something of an anomaly in India. But it's proof that changes are afoot. His success also gives young Dalits a reason to be more optimistic. "I am the first Indian to become the partner of an Abu Dhabi prince," says Khade, who created a joint venture with a group from the Emirates. See TIME's 2011 Person of the Year: The Protester.